Living in a multi-family home while renting other units are a great way to build wealth, but it is not as simple as some make it sound. 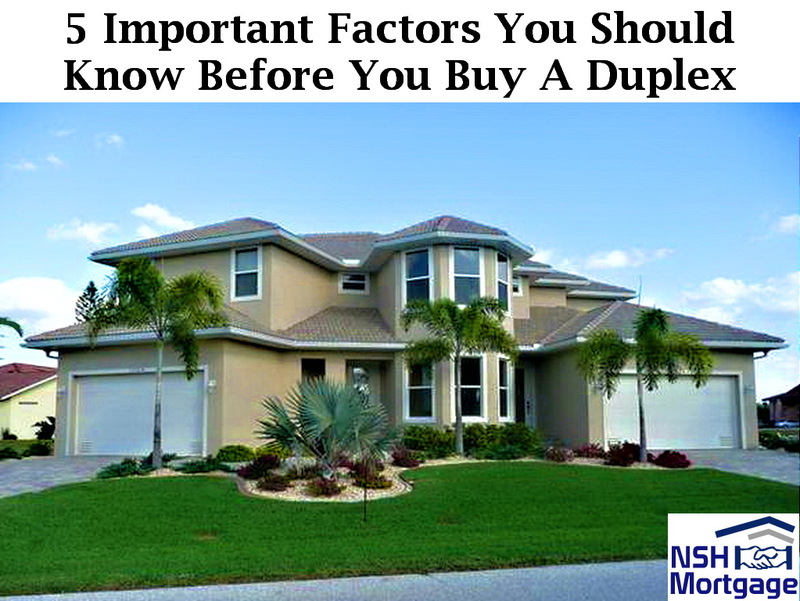 Five important factors you should know before you buy a duplex. NSH Mortgage has the knowledge and tools that can help you when you are trying to buy a duplex and which mortgage will best suit your needs. One of the smartest ways to build wealth is by buying real estate, particularly rental properties. Warren Buffett has recently made a statement saying that he would buy a couple hundred thousand single family homes, as an investment right now if he could. Buffett realizes the value that rental properties can bring not just in terms of monthly cash flow but also in appreciation and deductions. But let’s face the facts here. Most of us cannot afford to buy a few single family homes as rentals while affording our own home, let alone buy a couple hundred single family homes. This is why there has been a recent trend in home buyers purchasing duplexes or even multi-family units to live in one unit while renting out the others. When it comes to buy a duplex with less than 5% down, the strength of your application really counts. The question very often is not what you can afford, but whether you can fit within tight lender guidelines. What Exactly Is A Duplex? A duplex is a property with two units at one address. It is traditionally a way to get into the investment real estate game, because you get shelter for yourself, plus rental income and extra tax breaks. The rent can offset or even completely cover your mortgage and other costs. Uncle Sam likes duplex properties, and rewards them with two sets of tax rules. The owner occupied unit can be treated as a primary residence. The rental unit can be treated as investment property. You can depreciate and write off related repairs and improvements for the rental unit. For details, see a tax professional. Lenders have mixed feelings about duplex properties. The same property may or may not qualify for a mortgage depending on strange and obscure requirements. The chart below shows two ways that lenders can look at your income and mortgage. One Lender B allows you to qualify for a lot more. First, nearly all lenders reduce rental income by 25% to allow for vacancies and other income interruptions. If your goal is to get a duplex, triplex or quadruplex to live in one part and rent out the other or others, you may be limited in terms of the locations that you will get to choose from. You might have an even more difficult time finding a multi-family unit that you would be happy living in if you live in a more rural part of the United States. But if you are not extremely picky about the neighborhood you live in now, this could be your opportunity to get in and make some good money over time. For every benefit to owning a multi-family property, there is an equal and opposite reaction. The main benefit of owning a multi-family unit and living in one unit will be its rental income. Every month you will get a rent check that offsets your mortgage. One downside? Tax complexity. Just look at all the IRS rules regarding investment properties. Always consult your tax professional before making a large investment purchase, especially one that you expect to make deprecations and write offs from. Another benefit of owning a multi-family unit and living in one of the units while renting out the others is that you will always be close to your rental properties so that you can check the condition frequently. If loud music is being played late at night, you will be the first to understand it. If a pipe bursts or a toilet is clogged and your tenants need assistance, at least you will not have to make a long drive to fix the situation. The drawback? You are close to your tenants, so that loud music bothers you, not somebody else. And if you have a needy tenant, they will have easy access to you to voice their complaints. It may seem impossible to buy a duplex or multi-family unit with your budget, but the reality is it might not be as hard as you think. Additionally, if you buy an owner occupied duplex, you would definitely be able to use the potential rental income from the second unit to help you qualify for the purchase. For example, if you will be living in one unit and renting out the second, and you expect the second unit to be rented out for $1,200 per month, that income will be factored in to the lender’s qualifying ratios. How do you know what the second or additional units will rent out for? If you do not already have a lease in place which you probably do not, check rentometer.com for average rents in the area and use craigslist to help you verify rental prices for similar units. Keep in mind, the potential rental income may help you qualify for the loan, but it is not the only factor to be considered. You will still need to have a good credit score, a low debt to income ratio and a large down payment, typically around 25% of the purchase price or more. On a $500,000 duplex, you are looking at a down payment of $125,000, not including your closing costs such as escrow and loan fees. If you can qualify, there are lending guidelines for multi-family units which are pretty straightforward. Even though this can also pose a problem for you whether or not the second unit is permitted. Just because it produces income does not mean it is considered a unit. Most real estate agents can explain to you how hard it is to tell if a house has an unpermitted granny flat. Furthermore, financing can be even more difficult. In fact, if the property is not an actual duplex, just a single family house with a large wall partitioning areas and two separate kitchens, lenders may not be able to consider the potential rental income in your qualifying ratios, even if you can, rent it out. What if you want to move out someday? If you buy your multi-family unit with the intention of living in one of the units, the time may come when you are ready to move out and get something bigger. In that case, you may choose to sell the multi-family unit. If you do not absolutely have to sell it in order to qualify to buy the new house, consider getting a tenant in the unit you were living in and keeping the whole thing as a rental. Having already been a landlord for your neighbors, being a landlord for one more family will not be too much of a shock. Then, some lending guidelines allow underwriters to net the adjusted rental income and payment. Lender B uses this method. If your payment was $2,000, and the rental income was $1,000, you would only have to qualify based on a payment of $1,250. $1,000 * .75 = $750 adjusted rental income. And the $2,000 payment minus the $750 rent equals $1,250. This makes qualifying easier. However, other lenders, like Lender A, will need to add the adjusted rental income to your other income, and then hit you with the entire mortgage payment when qualifying. You qualify to borrow less under these guidelines. VA rules say qualified borrowers can purchase properties with one to four units and zero percent down. One unit, however, must be your primary residence. Buying a duplex with the VA program can be very advantageous. First, purchasing with nothing down is extremely attractive. Also, you will get residential mortgage rates and not investor financing rates, and eligible borrowers can benefit under the VA’s unique qualification system. Lenders generally qualify borrowers because of credit, income, and down payment size. The VA program uses a system based on the borrower’s residual income. This is the money left over at the end of the month based on household size and geographic location. 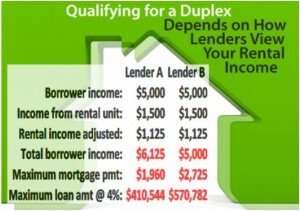 With a duplex, the income from the second unit can be used to increase residual income and qualify for a bigger loan. The FHA, like the VA, does not make investment loans. It requires all financing in its basic 203(b) program to be secured by a primary residence and you will need to occupy the home. Alternatively, you can use the FHA program with 3.5% down to buy property with one to four units, so a duplex is okay since you occupy one of the two units. While financing with 580 credit is available in theory, do not hold your breath. Only 5.5% of all FHA backed loans have credit scores between 580 and 619. As is usually the case with mortgages, higher credit scores or larger down payments are a major key to underwriting success. Conforming loans are those mortgages lenders can sell to Fannie Mae and Freddie Mac. They are commonly available with 5% down when financing a single family prime residence. However, the rules change when financing a duplex. For instance, the Conventional 95% financing available to single unit residential buyers morph into 15% down. Whereas, with Fannie Mae its 15% to buy a duplex, while Freddie Mac demands 20% up front. Why is it that duplex buyers are expected to have bigger down payments with conforming loans? Ideally, you get great tenants who pay their rent and do not drive you crazy. Unfortunately, the world is not ideal. You may not like your tenants. They may not like you. They may not pay their rent on time. Lenders dislike risk, in their eyes, the least risky mortgage finances an owner occupied, single family residence with 20% down and a credit score nudging 800. A duplex is only half owner occupied, and it is something other than a single family residence, a hybrid that is a half house, half investment property. The buyer presumes that some or all of the mortgages will be offset with unit rent. The lender wonders what happens if there are vacancies or big repairs. While the FHA has a three month reserve requirement for properties with three and four units. It does not have a cash requirement for a duplex. But the VA requires six months of cash reserves to buy a duplex. While borrowers may be able to get by without the equivalent of several monthly mortgage payments in the bank. To protect your interests and your credit score. Always have real cash in the bank, and a checking account attached to a line of credit.